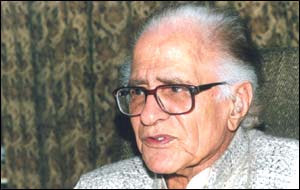 Ahmad Nadeem Qasmi (real name, Ahmad Shah Awan), PP, SI (Urdu: احمد ندیم قاسمی) (November 20, 1916 – July 10, 2006) was a legendary Urdu language Pakistani poet, journalist, literary critic, dramatist and short story author. With some 50 books of poetry, fiction, criticism, journalism and art to his credit, Qasmi was a major figure in contemporary Urdu literature. His poetry stood out among his contemporaries' work for its unflinching humanism, and Qasmi's Urdu afsana (short story) work is considered by some second only to Prem Chand in its masterful depiction of rural culture. He also published and edited the prestigious literary journal Funoon for almost half a century, grooming generations of new writers.